Sting.com > News > UK customers can now buy wine, olive oil and honey produced at Sting and Trudie Styler's home in Tuscany, Il Palagio! 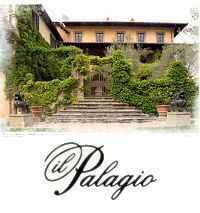 UK customers can now buy wine, olive oil and honey produced at Sting and Trudie Styler's home in Tuscany, Il Palagio! Available at www.palagioproducts.com. The Villa Il Palagio perches elegantly at the top of a long steep drive, overlooking the distant Tuscan hills and the undulating countryside which has always had profound agricultural significance. The nearby medieval town of Figline Valdarno was known as the “barn of Florence” for its abundant corn supplies. Grains, wine, oil, sugar beets, peaches, apricots and cherries have long been grown here. The estate extends to some 350 hectares, much of the land given over to forest, incorporating some beautiful lakes. Il Palagio has always been farmed. In the late 1700s the Martelli family purchased the property and as their wealth grew, so did the estate. In 1819 they sold to the Countess Carlotta Barbolani of Montauto, the widow of the Duke of San Clemente and it remained in this family’s hands for some 150 years. At the beginning of the twentieth century Duke Simone Vincenzo Velluti Zati di San Clemente commissioned several new buildings including a grain store, oil mill and wine production area. When Sting and Trudie first came across the estate in 1999, it had by then fallen into a state of disrepair. They set about the task of lovingly restoring the house, the outbuildings and the land to their former glory. Il Palagio is now so prolific in output that Sting and Trudie have opened a farm shop selling everything made or grown on the estate, including fresh vegetables and fruits, and the local salami. Now for the very first time these same Palagio products will be available to order online – direct from the heart of Tuscany to your door.